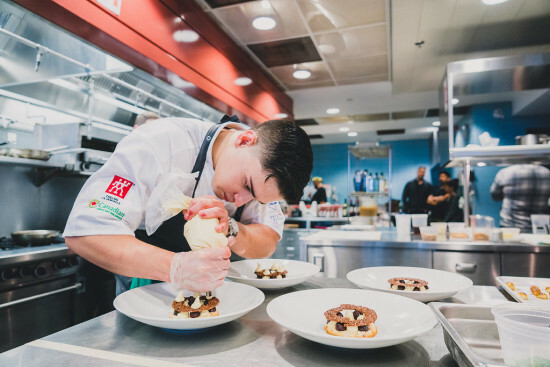 After heated regional competitions, held at top culinary institutions in Calgary, Montreal, Toronto and Vancouver, eight young chefs have been selected to compete at the national finals of the Hawksworth Young Chef Scholarship Competition to be held at George Brown College on Saturday October 13th 2018. The finalists will compete in a ‘Black Box’ cook off in front of some of Canada’s most esteemed Chefs and culinary professionals to win a $10,000 prize, an international cooking stage, a range of sponsor gifts and the ultimate bragging rights to being named Canada’s most talented young chef. Finalists of the 2018 Hawksworth Young Chef Scholarship competition will gather in Toronto for a three-day participant program that begins on Thursday October 11th with an Egg Farm Tour at Mullet Koop Family Egg Farm, sponsored by Egg Farmers of Canada, followed by a welcome dinner and garden tour at the famed Langdon Hall with chef Jason Bangerter courtesy of Garland Canada. On Friday October 12th The Italian Trade Commission invites participants to experience a pasta themed master class led by Michelin-starred Chef Luciano Monosilio, while Cacao Barry will host a chocolate workshop at CXBO chocolates with chef Brandon Olsen later that afternoon. On Saturday October 13th the ‘Black Box’ competition kicks off at 8:45am EST with final judging at 1pm EST, awards standings are announced at the evening reception. These unique experiences are offered as part of the scholarship’s goal to build a community where resources, ideas, information and advancements in the culinary field can be shared. Guests are invited to support the Hawksworth Young Chef Scholarship foundation by joining chefs, judges and participants for a celebratory awards reception to be held at The Fairmont Royal York, Grand Ballroom from 6:00pm – 8:30pm on Saturday, October 13th. Tickets are priced at $50.00 and include welcome bubbles, fine wines and canapés. Tickets can be purchased at www.hawksworthscholarship.com, all proceeds support the foundation.